Posts tagged "rent office space"
Home» Posts tagged "rent office space"
Vacancy rates for the total industrial market in Central Pennsylvania are the lowest they have been since third quarter 2012 at 7.7 percent. This is a 0.6 percent drop from last quarter’s vacancy rate of 8.3 percent. The Central Pennsylvania flex market finished the year with a 9.7 percent vacancy rate and the warehouse market at 7.6 percent. This decline in vacancy rates reflects a combination of expected continued economic growth and positive fundamentals driving the U.S. industrial sector. Lower gas and electric costs in the U.S. compared to developing economies is leading to manufacturing being “on-shored.” Also, an uptick in e-commerce is increasing the amount of goods stored in warehouses as opposed to bricks-and-mortar retail stores. As a result, these declining vacancy rates have stirred up a lot of real estate action in the fourth quarter. Currently, 424,000 square feet of industrial property are under construction. YTD Net Absorption for Central Pennsylvania is 1,852,412 square feet with YTD Deliveries at 720,000 square feet. First Logistics Center @ I-83 was listed number one of the top eight YTD Deliveries in the Philadelphia Industrial Market. This site is a 708,000 square-foot state-of-the art distribution/warehouse facility located in York, Pennsylvania that delivered in fourth quarter 2013. 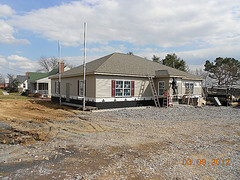 This quarter’s list of Top Under Construction Properties included a site at 600 Independence Avenue, Mechanicsburg, PA. This project is set to be completed in second quarter 2014 and will have an RBA of 24,000 square feet. Just down the road, at 500 Independence Avenue, is the location of one of this quarter’s Select Top Sales. This 342,498 square foot industrial space sold to Duke Realty Corporation for $22,567,200 in August of 2013. But the largest sale to take place in the Central Pennsylvania market was Ollie’s Bargain Outlet Distribution in York which sold for $31,671,000 in March 2013. In total, 4 of the 9 Select Top Sales between October 2012 and December 2013 took place in the Harrisburg submarket, specifically York and Mechanicsburg, totaling $101,246,771 in property. Additionally, 7 of the top 10 Industrial Leases, based on leased square footage for deals signed in 2013, also took place in the Harrisburg East or Harrisburg West submarkets. After having reached their lowest rate since 2011 during second quarter 2013, Quoted Rental Rates continue to rise slightly to $3.89 per square foot per year. Fourth quarter 2013 closed on an active real estate market for the industrial sector with decreasing vacancy rates and increasing construction. One possible catalyst for this trend is the devastating Japanese tsunami and Thai floods that highlighted the dangers of thinly stretched supply chains. Entire plants had to be shut down because of inadequate inventory. As a result, companies are moving away from the “just in time” supply chain management, where companies keep only enough inventory on hand to meet immediate needs and are instead actively expanding their industrial and warehouse spaces. The information in this report is based on CoStar’s Fourth Quarter 2013 Market Report. Designed to boost development and purchases in underdeveloped areas, KOZ’s reduce or eliminate specific taxes to investors. Those who purchase or lease within the Keystone Opportunity Zones are eligible to participate in these beneficial programs simply with the completion of an application. This program encourages both expansion and economic growth within the Central Pennsylvania region. The first KOZ was developed in 1999 by Pennsylvania Governor Tom Ridge. In 2001, another round of Keystone Opportunity Zones was approved, extending the areas available for benefits. A third round was authorized in 2003. The program has been quite successful in the Central Pennsylvania area, providing jobs and increasing real estate investments. In order to qualify for the tax benefits, the property must be purchased within the designated zones. The zones chosen by the city are often vacant industrial land and vacant outdated industrial buildings throughout the region. No existing businesses have been chosen by the Commonwealth for participation in the KOZ program. An example of a local property in the Central Pennsylvania area is 815 Market Street in Harrisburg, Pennsylvania. Weighing in at 250,000 square feet and seated on 11 acres, this particular building was previously owned by the U.S. Postal Service where it was used as a sorting facility. The property is considered to be ideal for a manufacturing or distribution operation, given the proximity to major markets in the Northeast region. Tax breaks are an invaluable resource for both new and established businesses. In addition to the tax reductions or eliminations, KOZ’s are breathing new life into under-utilized areas. Keystone Opportunity Zones are emerging as a breakthrough idea, and being met with great success and further expansion. New properties and subzones are also being added as the success of the program continues. Don’t miss out on this opportunity! Keystone Opportunity Zone properties are another one of the reasons I am proud to make central Pennsylvania my home base. For questions regarding office space in Central Pennsylvania, please contact me by email: mkushner@omnirealtygroup.com or by phone at 717-657-5833. As a practiced commercial real estate broker, I can help you find the property that suits your needs. Dedicated to growing an Entrepreneurial Ecosystem in Central PA, the Murata Business Center provides startups with the office space and essential programs needed to help them flourish. This property is owned and operated by the Capital Region Economic Development Corporation (CREDC) and acts as an incubator for aspiring businesses in the area. Operating as a subset of the Murata Center, the Ben Franklin TechCelerator Program offers startup programs designed to help a small business launch successfully. Program features include shared workplace, marketing research tools and use of standard office equipment to enhance productivity. The Murata Center also offers mentoring programs with one-on-one guidance from experienced professionals that were once in a start-up phase themselves. This program will assist you in avoiding some of the pitfalls commonly associated with small businesses. Their weekly group sessions specialize in writing business plans and understanding core marketing principles. Past tenants also offer informative presentations to allow members to learn from their experience. Another distinguishing feature of the Center is the Incubator Program. Inside this program, a team of professionals determine what a company needs to succeed and will offer two-way communication to support those needs. The Murata Center is seated in beautiful Carlisle, PA. With Amtrak services and Harrisburg International Airport within a short distance, the office space is close enough to get you wherever you need to go. All businesses within the Murata Center are provided with reasonably priced office space, business support services, and resources tailored to emerging small businesses. Tenants also have access to an Advisory Board consisting of leaders in business, education, economic development, finance and entrepreneurship. The function of the board is to offer guidance, counsel and mentorship to all businesses within the Center. This commercial real estate property is just one of the many features that make me proud to call Central Pennsylvania home. For information about office space in Central PA, please contact me by email: mkushner@omnirealtygroup.com or by phone: 717-657-5833. As an experienced commercial real estate broker, I can assist you in finding the property to fit your needs. The Hershey Center for Applied Research (HCAR) provides Central Pennsylvania with a state of the art facility for medical research and technology. This booming industry is a valuable part of our community. HCAR helps to give both local and global tenants access to advanced technology and other research resources, immersing them in a climate of innovation. The facilities at HCAR contain the only fully-prepared wet and dry lab space in the Mid-Atlantic region. Tenants of the facility are given access to the tools required for success and advancement in the research industry. The strategic partnership with Pennsylvania State University and the Penn State Milton S. Hershey Medical Center provides HCAR with competitive access to advanced technology and research resources. HCAR is a Wexford Science and Technology property, a company committed to supporting growth and strengthening the surrounding community. HCAR is part of a large network of thriving research based businesses dedicated to advancement in their respective fields. Tenants at HCAR are working on some of the world’s most cutting-edge scientific projects, making them part of a burgeoning community for life science and technology based business in Central Pennsylvania. Located in Hershey, Pennsylvania, HCAR is conveniently located near many major cities including Philadelphia, Washington D.C., Pittsburgh and Baltimore. HCAR is just over 10 miles from Harrisburg, Pennsylvania’s state capital that was recently named 12 of the 50 smartest places to live by Kiplinger’s Personal Finance Magazine. Hershey’s local high school was named in the top five percent of public schools in the country by Newsweek Magazine. Hershey is an emerging hot spot in the Central Pennsylvania area as it’s home to ample entertainment options and valued real estate. HCAR consists of a three-story, 80,000 square foot and multi-tenant facility with plans for future growth. The buildings were designed and built to adhere to environmentally-friendly construction standards. There are shared resources for tenants including conference rooms and building security. HCAR facilities are also fully customizable to suit each individual tenant. The building houses businesses already specializing in medical science, nanotechnology and life sciences. HCAR is ready to provide services for businesses in the science and technology sector from emergence to maturity. It also allows for the creation of new businesses through the transfer of technology among many different types of businesses, including nonprofit organizations. The staff at HCAR will work with businesses to provide the services necessary for competition in their specific field. The Hershey Center for Applied Research is another reason why I’m a proud Central Pennsylvanian. For more information on commercial real estate in the area, please contact me by email: mkushner@omnirealtygroup.com or by phone at 717-657-5833. As an experienced commercial real estate broker, I can assist you in finding the property you need. 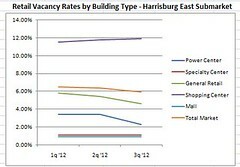 The Harrisburg East retail market experienced a lower vacancy rate during the third quarter of 2012.The rate ended at 5.9% compared to the previous quarter when vacancy was 6.4%. The third quarter represented the first time in 2012 where the retail vacancy rate was below 6%. So far in 2012, the largest retail lease signing in the Harrisburg East submarket was the 31,436-square-foot lease signed by Ross Dress for Less at the Cedar Shopping Centers, Inc. followed by the 18,120-sqare-foot lease signed by Variety Store by NAI/CIR. Both occurred in the first quarter 2012. The average dollar amount per square foot continues to slightly fluctuate. The average lease rate for retail space in the Harrisburg East submarket is now at $11.94 per square foot, compared to $12.20 per square foot and $12.00 per square feet in the second and first quarters, respectively. 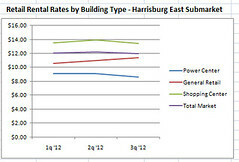 For the second consecutive quarter, there were no new sales for the Harrisburg East retail market. During the first quarter 2012, there were two sales totaling $102.1 million. The largest retail sale occurred at the Outlets at Hershey. The 237,618 square foot outlet center was sold from its previous owner, the LMS Commercial Real Estate to the Tanger Factory Outlet Centers for $56 million. The second largest retail sale occurred at Colonial Commons in Harrisburg. The 419,978 square foot shopping center was sold from its previous owner, The Blackstone Group to the CSC Colonial Commons Partnership L.P. for 46.1 million. As we continue to develop our social media communications, we also have the opportunity to learn from others. We’ve followed conversations across platforms to devise a list of some of the folks we keep our eye on. Here’s our list of the top five Commercial Real Estate (CRE) professionals in social media and why we love to follow them! Barbi is active and accessible on Twitter. She’s often publishing #CREDaily or sharing information about PICOR’s operations, marketing or new media as well as theresearch and finance activities from within the organization. Angela has the inside scoop on CRE trends. She shares this content as well as other relevant news or information pertinent real estate professionals, business owners, and the public audience alike. Lisa keeps CRE professionals up-to-date on the latest education, advocacy, and event information from within the organization. We enjoy following her tweets as events unfold. 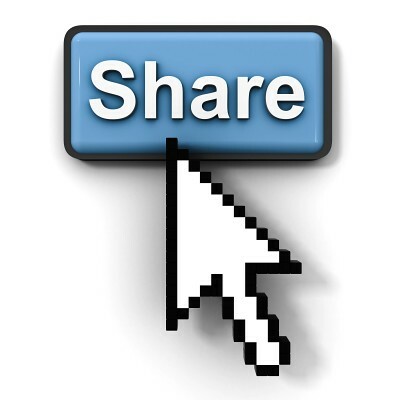 Duke is to the CRE world as good content is to social media success – a must! Duke has his eye on global, national, and regional industry news. We enjoy reading his blog on a variety of topics related to the industry, following his tweets, and participating in discussions on LinkedIn groups. Which CRE professionals to do you follow? Any you can add to this list? The Capital Region Economic Development Corporation (CREDC) has a variety of programs available to help area businesses purchase real estate.These programs can be used by businesses to purchase property or equipment for their operations. CREDC’s Business Finance staff works directly with the applicant to guide him/her through the application process, while working hand-in-hand with the applicant’s financial institution. CREDC also works with businesses to help them find the best option for their situation. Overall, CREDC can help you close the deal. CREDC’s involvement helps to close the deal by reducing the Financial Institutions risk through lower exposure and improved collateral position. CREDC’s loan also benefits the client through lower interest rates, long-term fixed interest rates that stabilize a portion of the debt payments, and keeping cash in the client’s pocket to finance working capital and/or growth needs. To qualify for real estate projects, the property must be owner-occupied. For more information about the programs or to discuss options, contact Shaun Donovan at (717) 213-5033 or go to credcpa.org. The Capital Region Economic Development Corporation (CREDC) serves as a catalyst for business development within Cumberland, Dauphin and Perry Counties by offering services such as loans, economic development incentives and business location support. Many of the programs are aimed at helping existing businesses within the region grow and prosper. We do, however, help businesses find the appropriate location for their business through our site selection program. The site selection program is a way for businesses to confidentially search for properties that meet their criteria. Whether it is an existing building, or a lot for development, CREDC helps guide the process in matching potential businesses with their ideal location. Our incoming projects come from four sources: direct calls from companies, the Governor’s Action Team, Pennsylvania’s Offices of International Business Development, and site selection consultants. We help these groups by working with the commercial real estate community. CREDC does not directly benefit from site selection activities. We act as a conduit for matching companies with the correct site and encouraging the business to stay in the region or locate here from other places. To assist with the site selection prospecting we have access to a statewide database of available commercial and industrial properties through http://www.pasitesearch.com. Properties listed in this system can be viewed by the public and is the first place that the Governor’s Action Team looks whenever a new project is created. Many of our incoming projects already have preferred locations listed on the PA Site Selector website. Commercial Real Estate agents are encouraged to include information about their properties to the site which is available at no cost. The website directs any questions about building or lots to the real estate agent that has the listing posted. One reason that companies come to CREDC for site selection is to remain anonymous through the initial phases of their search. There are many reasons that companies prefer to remain anonymous such as labor concerns, competitive forces, and publicity concerns. Often these companies are in the very initial stages of their search and do not want to be known until they can evaluate the opportunity and make a preliminary decision. Some companies eventually reveal who they are but many remain anonymous. CREDC works with companies from around the globe that are looking to find a location. Some of the projects involve comparing our region to other places around the country. Other projects have a more local focus in which companies are only looking at several counties. In addition to locating the site, we provide information to the company about the region and help the company find resources to make the project work. This includes adding regional information to RFI requests and working with the Governor’s Action Team on developing packages for a company looking to locate here. By working together with the commercial real estate community, we have been successful in attracting both large and small businesses. Some of the most recent businesses include Lennox Industries, Quality Bicycle Products and WorldPantry.com. Last year, we completed three site selection projects in our region. Currently, we have a few projects that are in the final stages. Tough economic times have led to an increase in vacant space among retail centers and malls across the country. When vacancy rates are high, some scramble to fill the space and generate income by offering temporary rentals or seeking out nontraditional tenants or even government agencies. A practice that has been gaining momentum is to market space to house web-based businesses, small business start-ups and incubator programs. Last week, the Central Penn Business Journal reported the possibility of vacant kiosks and shop spaces in the Harrisburg Mall becoming new homes for startups as a way for the mall to attract new visitors. The initiative is called, “The Futureland Project,” and the goal is to have the public interact with the young companies — and their technologies. They are even considering using the former Barnes and Noble bookstore as a coworking space. The idea of transforming large retail centers to house business start-ups is taking hold in other areas of the country as well. In California, Kimco Realty Corporation created Kimco Entrepreneurs Year Start (KEYS), an incubator program for aspiring entrepreneurs seeking to launch their first retail venture. Kimco owns 125 shopping centers that house more than 3,200 stores, and has more than 100 small retail spaces available for KEYS participants. Participants in the program get free rent for one year, discounted property charges, a flexible four-year lease option after their first year of operation, and access to Kimco’s business counselors. Meanwhile, DDR Corp. has formalized its program, called “Set Up Shop,” with 24 centers in the Atlanta area. DDR is partnering with SCORE, a non-profit dedicated to educating aspiring entrepreneurs to offer flexible lease terms and business advice to retail start-ups. The venture proved so successful that by April, DDR made the decision to roll out “Set Up Shop” at an additional 24 centers in Florida. Incubator programs are designed to support the development of entrepreneurial companies through business resources and services. Business incubation focuses on the application of expertise by helping the entrepreneur achieve more than they would on their own. The Futureland project at the Harrisburg Mall is not a business incubator project, but it would offer visibility to those in the start-up phase, especially those in virtual or tech businesses. Startups often lack public exposure even though some are working on cutting-edge technologies. Futureland participants would develop a physical, interactive element to educate the public as well as drive interest in their startup’s products and services. Two months ago, we published an interview from the perspectives of both the builder and the owner of an office construction project in Harrisburg. The project is nearing completion and we thought it would be a good time to check in on their progress. Here’s a follow-up interview with David Martin of Michael L. Martin, Inc. and Robert Beachy, property owner. When do you anticipate completion of the property? Our goal is to deliver the project the last week of May (after Memorial Day). Has the recent rain impacted this project’s timeline at all? The rain has hindered our progress this past week and is forecasted to do the same this week. How else does weather impact the progress of constructing a property? Rain can really slow down the progress at this point in the project. Typically this is the time when we are doing the exterior finishes like curbing, parking lot paving, sidewalks, etc. This work cannot be done while it’s raining. Have any significant unexpected challenges arisen in this project? There have been a few, some of them were related to constant changes being made to building codes and ADA requirements. Getting a sewer hookup to the property has been the biggest challenge on this project. For you, what’s the most enjoyable part of the construction process? For me, the entire process is rewarding. If I had to pick one part it would be the design phase. Creating a plan that works best for the client is a challenge that I enjoy. Is this property turning out the way you envisioned it when you began this project? Yes, for the most part with some minor differences such as having to change some of our kitchenette cabinetry to comply with ADA guidelines. We had also hoped to have two windows in the basement but had to change it to one window because of the grade of the lot. What do your existing clients think about the re-location? No one has been in the space yet but clients that have driven by the building say it looks very nice and several of them commented about how nice the stone exterior looks. What value would you place on the role of a commercial real estate agent in the process of completing a new build? It was very helpful to have someone knowledgeable about the building process to advise us and who had prior relationships with other agencies and professionals that we needed to involve in our project. Now that the property is near completion, what are you thinking and feeling about this experience? We are pleased with how the project is turning out, but we’re also glad to be nearing the end! What recommendations do you have for others who might be looking to build? Spend time developing a thorough project budget with the assistance of a commercial realtor/developer. Know someone who has a lot of connections with other agencies and professionals. Be patient. Check on the progress of your project regularly. Hire a good builder with an excellent reputation.